We were thrilled to receive the notification that based on our Houzz reviews in 2013, we were now considered as part of the “Best of Houzz 2014″. 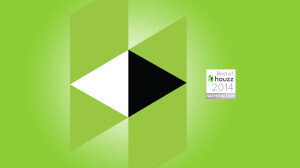 More on the award from Houzz: The Best Of Houzz award is given in two categories: Customer Satisfaction and Design. Customer Satisfaction honors are determined by a variety of factors, including the number and quality of client reviews a professional received in 2013. Design award winners’ work was the most popular among the more than 16 million monthly users on Houzz, known as “Houzzers,” who saved more than 230 million professional images of home interiors and exteriors to their personal ideabooks via the Houzz site, iPad/iPhone app and Android app. Winners will receive a “Best Of Houzz 2014” badge on their profiles, showing the Houzz community their commitment to excellence. These badges help homeowners identify popular and top-rated home professionals in every metro area on Houzz. We’ve really enjoyed interacting with the Houzz community and will continue to do so for the foreseeable future — it’s a fabulous community and resource with a rich intersection of talented designers and sophisticated consumers. It really has become one of the “go to” design resources for virtually everyone we work with.